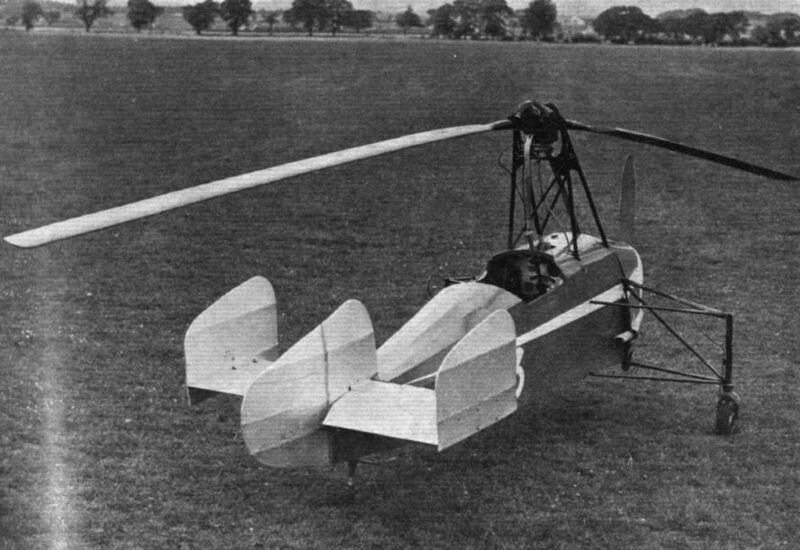 Advantages of the "Autodynamic" Rotor Head of New Weir Type: Jump-starts of More Than 20 ft. Altitude: Almost Any Field a "Girodrome"
IT may quite safely be said that no single step in the evolution of the Autogiro has ДальшеMore>>> marked such great progress as the introduction of the direct-start, or "jump-start," principle. In Mr. de la Cierva's first British machine, it may be recollected, the rotor was started by hand, a cord being wound around a drum and a number of men "running out" with the rope. The speed thus attained was not great, and it was necessary to taxi around the field for quite a time before the rotor speed was sufficient to lift the machine into the air. The next step was the biplane tail, in which one of the surfaces could be tilted in such a way as to deflect the airscrew slipstream on to the rotor blades and start them moving. This was an improvement in that the pilot was able to start his rotor without outside help, but the rotor speed was still rather low. 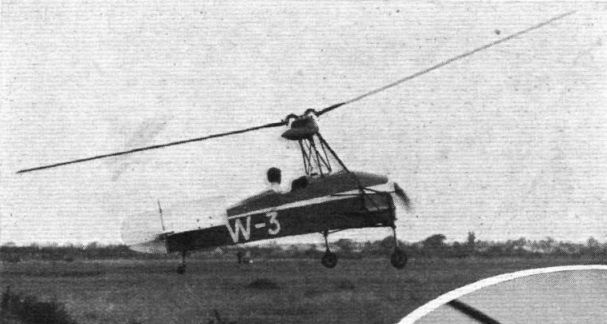 Then came the introduction of the engine-driven rotor head; this enabled the rotor to be speeded up to any desired extent, and brought about the possibility of take-offs with very short runs. At the same time, the suppression of fixed wings and the use of direct control of the rotor head was a great improvement. Last year Mr. de la Cierva announced that he had succeeded in making starts without any forward runs. In his lecture to the Royal Aeronautical Society he disclosed the fact that this was done very simply by merely sloping the hitherto vertical hinges in the blade roots. While the blades were being driven by the engine they lagged behind, and the sloping hinges had the effect of reducing the angle of incidence, so that the rotor could be speeded-up to almost any desired extent within reason. As soon as the drive was removed by declutching, the blades "caught up," and in so doing they increased their angle of incidence. The energy stored in the rotor was very considerable, and was sufficient to lift the whole machine several feet before the rotor had slowed to normal flying speed. A great deal of work was carried out, but the actual progress made was somewhat slow, due mainly to the fact that the great number of variables made a determination of the best combinations extremely difficult. Many months were spent in carrying out mathematical calculations, and it was not until certain parameters had been determined that actual engineering design could really be started. With the theoretical basis established by mathematics, the Cierva Autogiro Co., Ltd., and G. and J. Weir, Ltd., set to work on the design of new rotor heads, each attacking the problem in its own way, although naturally with very close co-operation. The outcome of all this work is the so-called "autodynamic" rotor head. In earlier types friction dampers were, it may be remembered, incorporated in the blade roots to limit the degree of freedom. In the autodynamic hubs that complication has disappeared, and everything is looked after very neatly by the particular arrangement of hinges and bearings. Owing to patent considerations it is not possible to disclose the exact details at the moment, but the two firms mentioned have evolved rotor heads which are both satisfactory, although they differ in their mechanical interpretation of the same original problems. To-day (Thursday) the Cierva Autogiro Co., Ltd., and G. and J. Weir, Ltd., are inviting a number of friends to a demonstration of the two new machines incorporating the autodynamic hub. 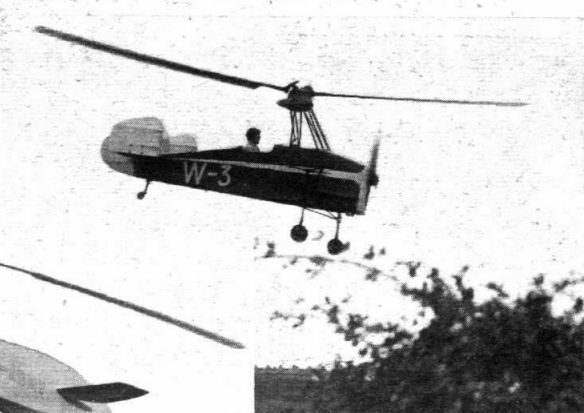 The Cierva machine is virtually a normal C.30 type, with the new head and with two-bladed rotor, while the Weir W.3 is an entirely new single-seater, powered by the new Weir engine described in Flight last week. During a recent visit to the Weir works at Cathcart, Glasgow, we were able to inspect the new Weir engine and the W.3 in which it has been installed, and to obtain the remarkable photographs of the machine with which this article is illustrated. 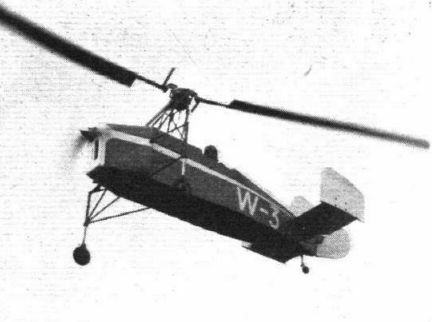 The W.3, it will be seen, is a very diminutive aircraft, and the fact that its rotor has but two blades makes it possible to store the machine in a garage of normal size. Should garage length be an obstacle (the rotor is of 28ft. diameter), it is quite an easy matter to unship one blade, when the machine can be housed in a very small space indeed. 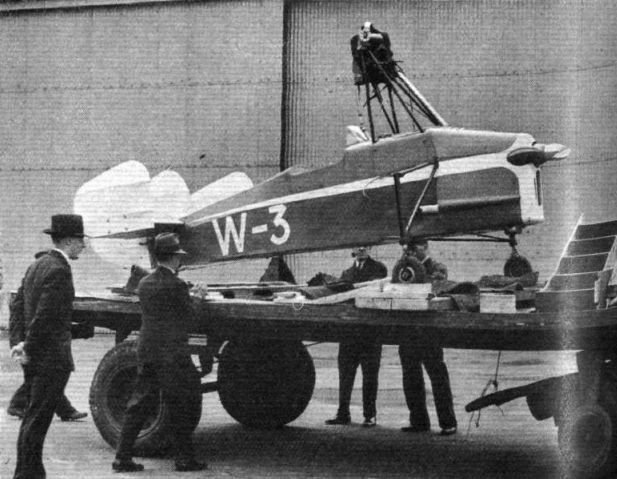 The aircraft part of the W.3 is very simple: a "box"-type wooden fuselage with an undercarriage of very wide track and long travel, a steel tube pyramid carrying the rotor head, and the engine in the nose. 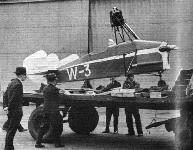 On the morning of Flight's visit to Glasgow the W.3 was being transported from the works to the aerodrome at Abbotsinch; this gave the opportunity to see how long it took to attach the rotor blades to the hub. But for the fact that certain adjustments of the pitch angle of the blades were required for test purposes, the mounting of the blades would have occupied a few minutes only. When the machine has gone into production the best angle will have been found and no adjustments will be needed. When the engine was run up the first impression was one of a very healthy exhaust note, coupled with very smooth running, and during the subsequent flights by Mr. Marsh this impression was confirmed. The engine undoubtedly runs very sweetly and delivers its power of 45-50 h.p. 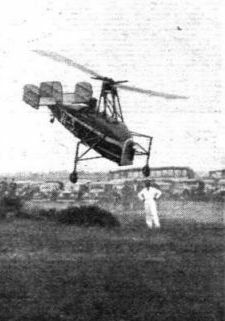 Taking off with the ordinary run is, of course, quite possible with the jump-start Autogiro. The rotor is not then run up to such high speed, and the length of run depends upon the percentage of rotor flying speed attained before the wheel brakes are released. A considerable number of jump-starts were made for the benefit of Flight's photographer, and it was noticeable that with each start Mr. Marsh gained extra experience and confidence. Some of the jumps were approximately 20ft. in height, and it was noted that there was then no "sink" when the machine began to gather forward speed. When the rotor was not speeded-up quite so much, the actual jump was perhaps twelve or fourteen feet, and, after passing the peak of the jump, the machine sank slightly until the forward speed was sufficient to enable it to begin its climb. From the cine film pictures it is possible to form a very good idea of the behaviour of the machine during a jump-start. It might be explained that less than one-third of the pictures actually taken during the particular start are published. Actually, the period of time covered by the pictures shown is 2 1/4 seconds, the length of film from which the photographs were taken covering thirty-six separate exposures. 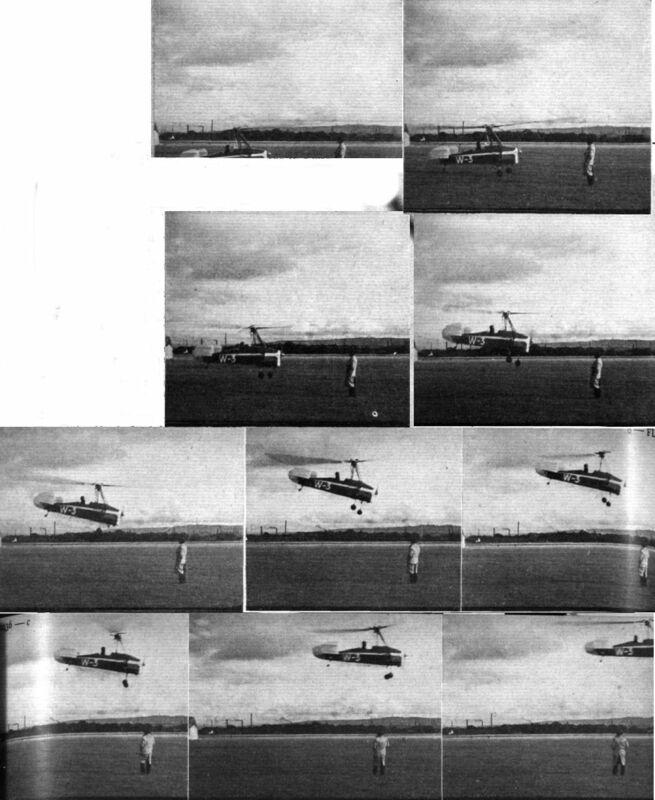 In that time the machine has reached approximately 20ft., and has begun its horizontal flight, as is shown by the fact that in the last picture it is passing the man standing under it. There was no subsequent "sink." In another cine film, not published, the operation of the control is seen quite clearly. The stick is held back until the top of the jump is reached; it is then eased forward, and the machine begins to gather headway. The nose-down attitude in some of the pictures is, of course, due to the fact that the c.g. of the machine is slightly ahead of the centre of lift. The speed is not yet sufficient to give the tail surfaces much effect, but as the top of the jump is approached and the path changes from a vertical to a horizontal direction, the horizontal fin area becomes effective and the fuselage again assumes an approximately horizontal attitude. 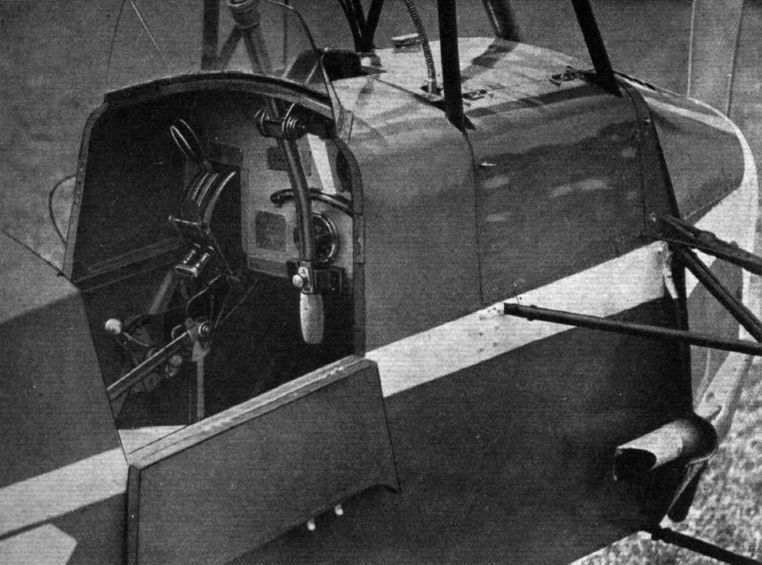 Inside the cockpit of the W.3 are found the usual instruments, plus the controls peculiar to the Autogiro. The stick is double-jointed in order to provide the orthodox pull-to-climb-push-to-dive type of control. With the new rotor head the tendency for the control to become heavy at high speeds has disappeared, and the machine is now very light on the stick at all speeds. On the left wall of the cockpit are the controls for starting. They have been "gated" to prevent a pilot from making any mistake by forgetting the sequence of operations. Moving the lever into "first" engages the drive from engine to rotor head. Shifting into "second" engages the clutch. This operation must be carried out gently to avoid straining the transmission. When the clutch is fully engaged (with the engine running slowly, of course), shifting into "third" puts the wheel brakes on. The throttle is now slowly opened until the desired rotor speed has been reached. A separate push-button is then pressed, which releases the three engagements simultaneously, and the machine jumps into the air. On the experimental model the rotor brake is operated by a separate lever. It is possible that this arrangement will be changed in the production machines. The incidence of the rotor blades depending upon whether they are "lagging behind" or "catching up" with the drive, it is obvious that, if the engine splutters and slows down momentarily during the speeding-up of the rotor, the blades will overrun the drive, and the machine will tend to rise. Actually, this happened once during the demonstration at Abbotsinch, and the machine gave a peculiar "heave," but did not leave the ground, the rotor speed being insufficient. On the production machines some form of stop will be provided to prevent this from happening. It is understood that a batch of W.3s will be put in hand at once, and that when the accumulated experience with these is available a really large production programme will be embarked upon. The question that will naturally come to mind is “What will the machine cost?” Until some experience has been obtained it is obviously difficult to decide definitely. 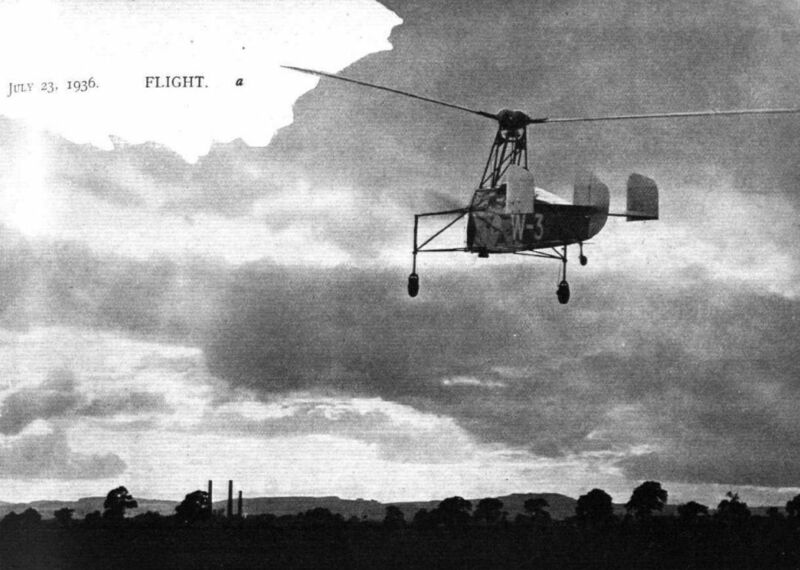 The L100 autogiro which certain newspapers glibly announced a year or two ago is obviously sheer moonshine. Unless and until the machine is produced at the same rate as one of the popular motor cars, such a price is, of course, quite ridiculous. It is thought, however, that before long it may be possible to buy a W.3 for something in the neighbourhood of L500. Compared with aeroplane prices this cannot be regarded as excessive. It is quite evident that the rotor head of an autogiro, and its drives, etc., is comparable with the gear box and differential of a motor car. Cheapness is not obtained by extreme simplicity in design, but by quantity production. Lord Nuffield did not get the price of his cars down until he began to manufacture in large quantities. While rotor heads are being manufactured by hand, so to speak, they must of necessity be expensive; but if they can be done in hundreds the production cost will tumble down. That, as Flight sees it, will be the future history of the Autogiro as far as price is concerned. 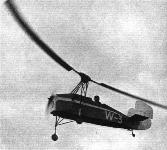 The Weir Autogiro is fitted with a Weir engine of 45 h.p. A new version is expected to begin its test flights shortly.